The Walking Dead The Prison - Board Game features the incredible artwork by series artist Charlie Adlard, and is the stand-alone sequel to the hit 2011 game Robert Kirkman's The Walking Dead: The Board Game, published by Z-Man Games. After months in the wild and on the run, Rick, Lori, Andrea, Glenn and the rest of the survivors find the ultimate survival spot outside Atlanta, Georgia: a fenced in prison, still in good condition. The survivors end up struggling with each other for control over the group's fate. 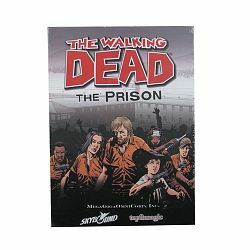 The Walking Dead The Prison - Board Game is a new, stand-alone board game in which you and up to five of your friends take on the role of one of the six leaders of the group from Robert Kirkman’s The Walking Dead: Rick, Tyreese, Glenn, Dale, Andrea, and Michonne. The goal of the game? To earn enough Leadership Points to take control of the entire group of survivors. To earn Leadership Points, they must fight their way through the zombie swarm in the prison yard, bash their way through the prison itself, reach their destination and secure the area. Along the way, players will have to collect additional resources, rescue Followers, and as expected...fight zombies.